The military historians of West Point have given the name "Centrifugal Offensive" to the opening Japanese offensive of the Pacific War, which was centered in southeast Asia but also included the Pearl Harbor strike and subsidiary operations intended to secure the flanks of the main advance. The roughly synonymous Japanese term for this offensive was "Strike South." The Japanese objective was the capture of the resource-rich Western colonial possessions in Southeast Asia (the Nampū Yōiki or "Southern Important Territories") and the establishment of an impenetrable defensive perimeter to ward off any Allied counteroffensive. Once these objectives were secured, the Japanese government intended to seek a negotiated settlement on favorable terms. The Japanese decision to go to war was driven largely by an American-led economic embargo, which deprived Japan of 90% of its oil needs and of other critical raw materials. The American terms for ending the embargo, a withdrawal from China and denunciation of the Tripartite Pact by Japan, were unacceptable to the Japanese military. With the European colonial powers either at war with Germany or under German occupation, the Japanese saw an opportunity to seize the oil fields and other natural resources of southeast Asia and create an economically self-sufficient Greater East Asia Co-Prosperity Sphere — which, for most Japanese leaders, was simply a euphemism for an expanded Japanese Empire. In addition, the Japanese Navy had long believed war with the United States was inevitable, and the passage of the Two-Ocean Navy Act by Congress in July 1940 meant that the modest American naval superiority in the Pacific would become crushing by 1944. The latter consideration was probably decisive for including the Philippines in the list of targets. Had the Japanese limited their offensive to Dutch and British territories, Roosevelt would have had serious difficulty securing a declaration of war against Japan from Congress. However, while the Philippines were relatively poor in resources, they were strategically placed across the Japanese sea lines of communication to southeast Asia, and the Japanese Navy saw no point in taking the risk of leaving them in American hands when American naval resources for their defense would soon be overwhelming. The Japanese Army and Navy favored different strategies for the opening offensive of the Pacific War. The Army favored an attack on Malaya, followed by the Netherlands East Indies, then the Philippines, believing that Malaya would be a hard nut to crack and had to be taken before the British could send significant reinforcements. The Navy favored almost the opposite strategy, fearing that American air power in the Philippines would endanger the sea lines of communication to the Netherlands East Indies and Malaya if the Philippines were not neutralized first. The compromise reached was to secure both flanks at once. The Japanese were encouraged by the German success in using land-based aircraft, at Norway and elsewhere, in the face of Allied naval power, and therefore planned to advance simultaneously on two fronts. The first was directed primarily against Malaya, Sumatra and western Java, but also seized important points along the west coast of Borneo. The second front began at the Philippines and advanced through Makassar Strait to eastern Java. The western flank was covered by occupying Thailand while the eastern flank was protected by seizing strategic points in the eastern Netherlands East Indies, particularly in the lesser Sunda Islands and western New Guinea. The remainder of the Japanese defensive perimeter in the Pacific was extended by seizing Rabaul, the Gilbert Islands, Wake, and Guam. The offensive was to take place in three phases. During the first phase, Guam, Wake, and the Gilberts would be seized to secure the northern flank of the defensive perimeter. Thailand, northern Malaya, British Borneo and Sarawak, and the Philippines would also be taken. During the second phase, Malaya and Singapore would be conquered, along with southern Burma, the Bismarcks, and the northern islands of the Netherlands East Indies. During the final phase, the Japanese would complete the conquest of Java, Sumatra, and Burma. Resources for the offensive were spread dangerously thin, with just the equivalent of 11 divisions assigned to the entire Pacific and southeast Asia. For example, Japanese planners had estimated in 1926 that the conquest of the Phillipines would require three divisions, but only two divisions and a brigade (of which only one division was really first-rate) were assigned to the operation. The Japanese were able to pull this off largely because of Japanese supremacy in the air and superiority at sea. Each advance proceeded by leaps, with each leap directed against a strategic point having an airfield that could be rapidly converted to Japanese use. Each leap was short enough to be easily covered by land-based aircraft. Air units would then move forward to the newly captured airfield to cover the next leap. The Japanese carefully planned the offensive on a strict timetable to keep the Allies off-balance and unable to redeploy in time to meet each new threat. The Japanese Navy conducted extensive map exercises beginning in September 1941 and continuing through October. The plan was a significant departure from Decisive Battle Doctrine, particularly in Yamamoto's determination to abandon a fundamentally defensive strategy and take direct offensive action against the U.S. Pacific Fleet at the start of hostilities. Although the notion of a surprise attack on Pearl Harbor was not new (it had been war gamed by the Naval Staff College as early as 1927), only Yamamoto had the prestige to reverse years of settled doctrine and force the Navy General Staff to accept the plan. Most of the landings were unopposed, which was possible because the Allies did not have nearly enough troops to cover all the possible landing beaches. ... I did not think they would attack at Pearl Harbor because I did not think it was necessary for them to do so, from my point of view. We could not have materially affected their control of the waters that they wanted to control, whether or not the battleships were sunk at Pearl Harbor. In other words, I did not believe that we could move the United States Fleet to the Western Pacific until such time as auxiliaries were available, as the material condition of the ships were improved, especially with regard to anti-aircraft, and until such time as the Pacific Fleet was materially re-enforced. I thought it would be suicide for us to attempt with an inferior fleet, to move into the western Pacific. By contrast, the Japanese had excellent facilities in French Indochina, Palau, and Formosa in close proximity to the target area. The Centrifugal Offensive opened with Japanese landings at Kota Baharu in northeast Malaya and Singora and Patani in southern Thailand. The landings at Kota Baharu began an hour before the attack on Pearl Harbor. The Japanese Army plan called for landings in the predawn hours, and the Army correctly gambled that an hour would not be enough time for word to reach Hawaii and trigger any alert there. The landings themselves did not achieve surprise, since the British became aware of the Japanese convoys moving into the Gulf of Siam long before they made landfall. However, the Japanese convoys deliberately took a course that left the British uncertain whether their target was in Thailand or Malaya. The Americans were also aware of the Japanese naval activity, and this may have served as a useful diversion for the attack on Pearl Harbor. The Japanese were soon ashore and, after overcoming initial stiff resistance at Kota Baharu, began to move on the nearby airfield. The landings in southern Thailand were unopposed, and the Pearl Harbor attack was a brilliant tactical success for the Japanese Navy, securing the eastern flank of the offensive. Other Japanese forces crossed the border from China into Hong Kong and landed on Batan Island north of Luzon to establish a small fighter airfield. Eight hours after the Pearl Harbor attack, Japanese air raids caught most of the American aircraft in the Philippines on the ground and destroyed them. This stripped the American forces in the islands of air cover, and the lack of air cover and a devastating raid on the naval base at Cavite on 10 December forced the U.S. Asiatic Fleet to retreat to the south. On 10 December, the Japanese conducted small landings at Aparri and Vigan on northern Luzon; Makin in the Gilbert Islands; and on Guam, which fell in a few hours. 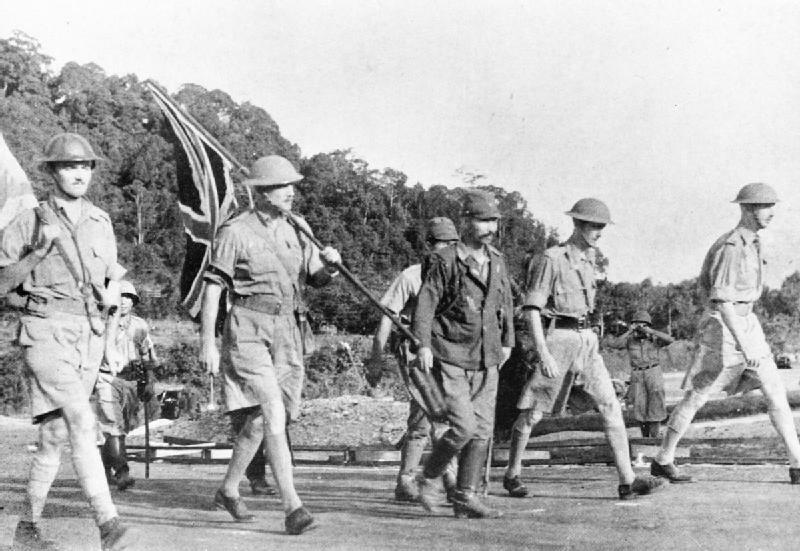 The next day, Japanese troops seized the airfield at Victoria Point, breaking the air bridge from India to Singapore. On 12 December, Japanese forces landed at Legaspi, tightening the blockade of Luzon. Meanwhile, the Japanese drove across the Malayan Peninsula from Singora, shattering the British defenses at Jitra and forcing the British to begin a long retreat back to Singapore. On 15-16 December, the Japanese landed at Miri and Seria on the northwest coast of Borneo and seized control of the oil fields. On 20 December, the Japanese landed at Davao and quickly drove off the poorly trained Filipino defenders. This gave the Japanese a major base from which to blockade the southern Philippines and through which to stage their advance into the Netherlands East Indies. Two days later, 14 Army landed its main force at Lingayen Gulf on the northwest coast of Luzon, and, two days after that, a second force landed at Lamon Bay, east of Manila. MacArthur ordered his forces to retreat to Bataan, conducting a holding action that was successful in preserving the American and Filipino forces but did not allow adequate supplies to be stocked in the peninsula. By 7 January the Americans were established on their main line of resistance, but were already on half rations. On 24 December, the Japanese seized Kuching, completing the conquest of Sarawak, and landed at Jolo, completing the isolation of the Philippines. On 8 January, the Japanese landed at Jesselton. Two days later, a Japanese landing force seized Tarakan, and Japanese air units immediately moved to the airfield to cover Japanese landings further south. On 11 January, the Japanese dropped paratroopers and landed forces at Menado on northern Celebes, seizing the large airfield and further tightening the blockade of the Philippines. On 17 January, the Japanese landed at Sandakan, completing their conquest of British North Borneo. On 23 January, the Japanese landed at Balikpapan to find the oil fields already put to the torch. They later massacred every European in the town in retaliation for the demolitions. However, on the night of the landing, a small American destroyer force slipped into the harbor and sank four transports and a patrol boat. This was the first American victory in a surface naval engagement since the Spanish-American War, and it was almost the only success achieved by the ABDA command. However, the Battle of Balikpapan failed to disrupt the Japanese time table. The next day, Japanese forces seized the magnificent anchorage and airfield at Kendari, which became an important staging base for the advance into the Lesser Sunda Islands. On the same day, South Seas Detachment seized Rabaul, establishing a strong base for the Japanese in the Bismarcks. On 30 January, the Japanese seized Amboina and its airfield, increasing the pressure on the air bridge from Darwin to Java. The Japanese continued to advance rapidly down the Malay Peninsula, forcing the last British forces to withdraw to Singapore Island on 31 January. The British poured reinforcements into Singapore, but these could not be integrated into the defense in time, and Singapore was surrendered on 15 February. On 9 February, the Japanese landed at Makassar, securing control of Makassar Strait. The next day, the Japanese completed the conquest of Borneo with landings at Banjarmasin on the south coast. With Singapore and the Makassar Strait firmly in Japanese hands, the way was cleared for the eastern and western prongs of the Japanese advance on Java. On 14 February the Japanese dropped a large force of paratroopers to seize the great oil field of Palembang, securing the area within two days with the help of additional troops coming up the Musa River. The loss of southern Sumatra isolated Java from the west. On 18 February, the Japanese seized Bali, isolating Java from the east. The Allies suffered a costly and embarrassing debacle in the Battle of Bali, in which a superior Allied cruiser-destroyer force failed to destroy a force of four Japanese destroyers escorting two transports while losing an Allied destroyer and suffering damage to other warships. The next day, 1 Air Fleet, arrived from replenishment in Japan after its triumph at Pearl Harbor, launched a massive raid against Darwin. This flattened the base supporting the remaining Allied forces in southeast Asia. On 20 February, the air bridge to Java was decisively broken with landings at Kupang and Dili on Timor. Following the raid on Darwin, 1 Air Fleet steamed south of Java to interdict any Allied convoys from the south as the Japanese began to move in their own invasion convoys. On 27 February, the main Allied naval force in the Netherlands East Indies attempted to intercept one of the invasion convoys, and was decisively defeated in the Battle of the Java Sea. The Japanese landings began on 1 March, and the Centrifugal Offensive came to a successful conclusion with the surrender of Java on 8 March 1942. The Japanese achieved all their initial war objectives ahead of schedule and with astonishingly slight losses. Only in the Philippines did the Japanese fall behind schedule, and this turned out not to matter much from a strict military perspective. Instead of the 20% to 30% naval losses anticipated in prewar planning, the Japanese had lost only 23 warships of destroyer size or smaller (for a total of 26,441 displacement tons) and 67 transports and cargo ships totaling 314,805 tons, along with a few hundred aircraft and a few thousand personnel. The Japanese showed considerable flexibility and the ability to orchestrate multiple simultaneous operations. The landings on Timor and Bali and the carrier raid on Darwin all took place within a single 24-hour period. This astonishing success was misread by Japanese planners, who failed to recognize that the Allies would learn from bitter experience and that American mobilization was certain to eliminate Japan's military superiority. Rather than consolidate their conquests and build their defense perimeter, as originally planned, the Japanese began looking for new worlds to conquer. Postwar, Hara characterized this unrealistic attitude as "Victory Disease", and there is wide consensus among historians that this attitude led to the Japanese setback at Coral Sea and the disaster at Midway. The Japanese victory in the Centrifugal Offensive had lasting repercussions, even though Japan eventually suffered total defeat. The weakness shown by the British and Dutch in their defense of the area permanently destroyed the prestige these Western powers had held with their colonial subjects, giving impetus to nationalist movements that were disinclined to welcome their former European overlords back after the Japanese were forced out. Only the United States retained its prestige, likely because of the leading role the U.S. played in Japan's defeat, the fact that American forces in Bataan held out longer than any other Western army in southeast Asia, and the fact that the U.S. had already set a date for the independence of the Philippines well before war broke out in the Pacific. We present here the order of battle of both the Allies and Japanese on 8:00 AM on 7 December 1941, the moment of the attack on Pearl Harbor, as completely as we have been able to ascertain it. A completely reliable order of battle is impossible to assemble, since Allied records of the period reflect the confusion into which the Allies were thrown by the Japanese onslaught, while many Japanese records were destroyed at the time of the surrender. However, the deployments of warships and land formations are reasonably reliable, except in China, where Japanese dispositions are somewhat uncertain and Chinese dispositions are very uncertain. Deployments of air units are also unreliable, in part because of their inherent flexibility and mobility. We show only those Allied units that were located in the Pacific Theater, which for our purposes is the region between 70 degrees east longitude and 110 degrees west longitude. This takes in the area from modern-day Pakistan through the Indian and Pacific Oceans to the westernmost part of the United States. The 70 degrees east longitude boundary also corresponded to the dividing line between the German and Japanese spheres of influence as negotiated by the Axis. Tables of reinforcements from the outbreak of war to its conclusion are linked from here. AO Iro at Truk CombinedFleet.com places it with Wake Invasion Force. Nationalist Chinese Army (Chiang; at Chungking) Chiang's Chief of Staff was Pai Ch'ung-hsi. His defense minister was Ho Ying-ch'in, an old crony. Chiang's chief of ordinance, Yu Ta-wei, was one of the most intelligent and least corrupt men in the military command, and was responsible for moving Chinese industry to the Chungking area. He would later arrange a similar move of priceless treasures to Formosa.